*Special Note: I am on maternity leave starting April of 2018 and will not be coming back until September 2018. I will not be taking on any new students during this time. 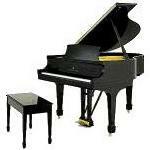 To begin learning and playing classical piano, practicing on a piano is optimal. A piano can be purchased or rented from a music store of your choice, but, actually, a keyboard is all that is really necessary for quite awhile. The keys should be the same width as piano keys (they should not be thinner). It should be capable of touch of sensitivity, which means that if you touch a key softly, the tone will sound soft, and if you touch a key harder, the tone will sound louder. The keyboard does not have to have all 88 keys that a full size piano has. The teacher can supply the new music book to the beginner, which you can purchase from the teacher during the first lesson. The cost is usually less than $10, depending on the book. Adult books are a little more expensive.